Three of my cousins came down to visit for their Reading Week and so we had our annual Farewell Nail Art Party, where we stay up till 2 am to complete our nail art the night before they leave. I was uninspired last night, so I didn't end up doing anything to my own nails and did my cousin Amanda's nails instead. She was a little indecisive at first, but I let her look through my old nail art album on Facebook and images I have been collecting on Pinterest (click to check out my awesome Nail Art Board). The converse nails caught her eye and so we decided to replicate the design. Before I go on with the fairly easy tutorial, if you are a polish hoarder, nail art addict and you are in the Markham area, check out a store called SOHO in Market Village. They have a sale going on where you purchase a mini OPI nail polish for $1.00 and get the second one 50% off! My cousins purchased about 30 mini nail polishes for themselves and their friends and ended up paying about $25 for it. Sick deal right? I don't know why it's so cheap, but I can tell you one thing though, it smells really funky. Despite the smell, there's nothing wrong with the application. It is just a little streaky in the first coat, but a second coat fixes that right up. 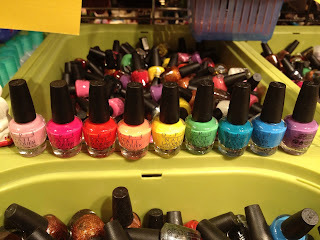 Anyways, if you head there have fun looking through the bins and bins of nail polishes! Apply two coats of colored polish of your choice and allow it to dry. Using your white polish, paint an upside down "C" on the tip of your nail and fill it in. I like to create the outline by painting it horizontally and then filling it vertically. Using a dotter, create six dots down the nail. Make sure they are parallel to each other. Next, use a toothpick and white nail polish to create small "x's" to represent the shoe lace. Finally, dip your toothpick in black nail polish and create a wide "U" near the tip of nail. 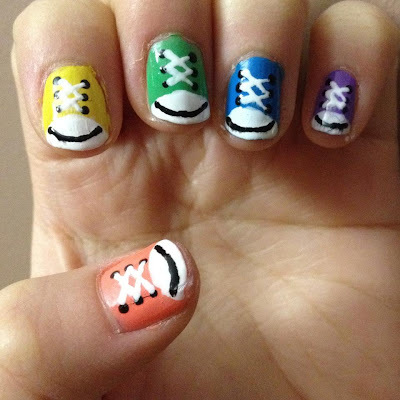 I think the next time I do this nail art, I want to add some patterns to it since Converses comes in all colors and patterns. Anyways, I hope you enjoy this short tutorial! Love it! Such a good idea. Awesome!! I am so doing that, and soon!! thanks so much for following my blog--it gave me a chance to visit yours. lovely blog you have, and am now following. have a great day! I have just done this to my nails for the first time and it turned out great! It was a little time consuming (about 2 hours) but it was worth it. Sooo cute! 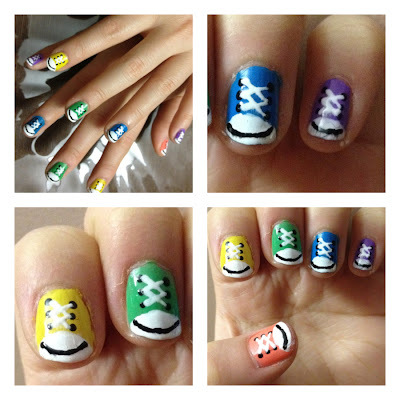 Your nail art is so awesome!! I've pinned a few on my pinterest, hope that's okay? Oh my gosh, oh my gosh, oh my gosh! I have a friend who ONLY wears converse sneakers. I'll have to show her this post! It's such a cute idea!